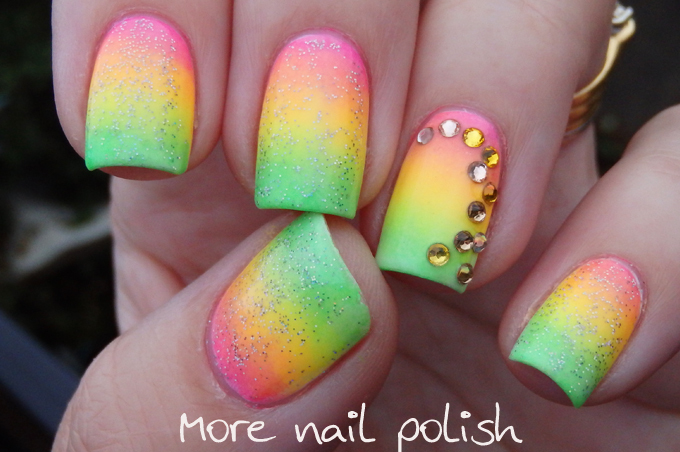 I wish I had some sun to show off these bright and glowing neon nails. I also really wish I had turned on my bright lights at night time when I was doing this mani and selecting the swarovski crystals. You see the bag of crystals I bought is a bag of mixed colours. I have to empty some out into a small bowl and then sort through them to get the colours I want for the mani. Can you believe that I thought I selected all the same colours! Doh! I only noticed when I walked outside into the natural light the next day and could tell some were a pale pink and others were a warm yellow. 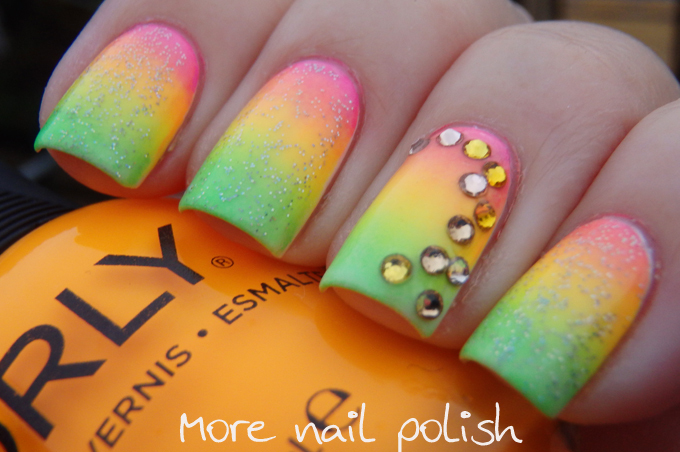 So lets just pretend that I deliberately selected those colours to compliment the neon gradient. 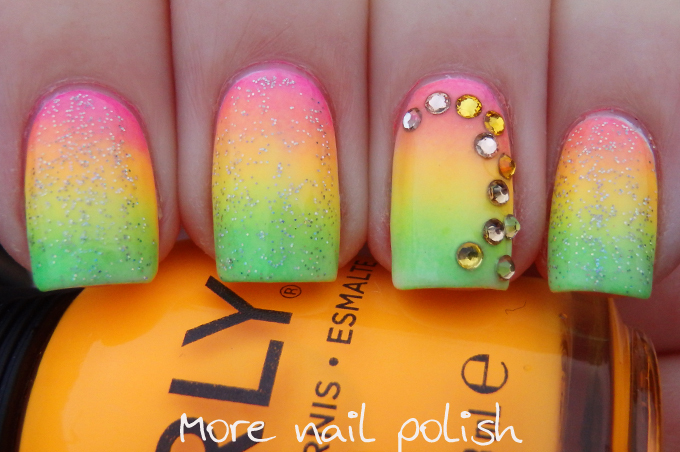 For the gradient I used Orly Neon Heat and Tropical Pop and Picture Polish Lime lite. I topped the gradient with Kester Black Mily Way, which is a very bright holo glitter, but without the sun it just looks like a regular silver glitter topper. Kitties, I'm one for randomness. Sometimes you get a better overall effect that way, and your unintentional varied crystals do that for this mani in my opinion. Love it! Very very pretty! 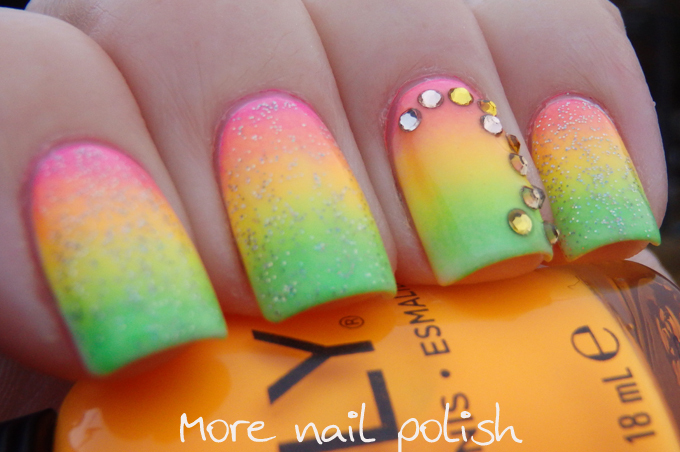 The gradient is perfect!